SANTA CLAUS DOES REALLY EXIST! by their HOPING and by their WISHES! If you, dear Brothers and Sisters, want to turn back to our TRUE FATHER, our TRUE MOTHER, pray explicitly to GOD, WHO IS LIGHT AND LOVE, and HE-SHE will answer. But SANTA CLAUS is not a substitute personality, but a perfectly original BEING. You can actually find proof of his existence - with your Heart-Chakra. Only the Heart-Chakra can tell and compare without a doubt vibrational frequencies and thus find out TRUTH beyond a doubt! The proof for the existence of SANTA CLAUS is, that you do find a vibrational frequency to compare, that there actually IS a vibrational frequency. HE IS REAL, YES, THERE ACTUALLY IS A SANTA CLAUS. IS GOD'S GIFT TO US ON THIS CHRISTMAS 2004! Dear Brothers and Sisters, this KNOWLEDGE will initiate a completely NEW WAY OF THINKING TO MEN! Most of all there will be a great change in our HEARTS - as they will be filled with JOY, because our childhood became much poorer when SANTA CLAUS vanished from our lives. Now the PAIN of our childhood can be HEALED. But today the minds of MEN are being REVOLUTIONIZED, because the vibrations of EARTH are steadily raised, which enables a NEW WAY OF THINKING, actually we have no other choice. The Magic World MEN have known until a few hundred years ago, ridiculed by our 'scientifical view on things' of the last centuries, returns and is verified by modern clairvoyants all over the world. But in the meantime MEN have surmounted their state of mind of former times, they have lived through the 'scientifical' period of thinking and looking at things and have TRANSCENDED it. Now they are WIDE AWAKE AND KNOW: What they experience, what they perceive is REAL. And this time they will not allow themselves to be forced by an inquisition to deny their own THRUTH - that is: to deny themselves - and call it a lie. So when you think of SANTA CLAUS, when you think of elves, fairies, giants and dwarves, let your brains stand aside - because the brain has narrow limits: It can grasp the world of matter but not the invisible WORLD, the NON-POLARIC WORLDS! GRASP THE INVISIBLE IN A HOLISTIC WAY, WITH INTUITION AND INTELLECT AND OPEN YOUR HEARTS - BECAUSE ONLY THE HEART CAN GRASP IT! I myself have 'SEEN' angels and dwarves IN REALITY, and through the direct contact of others I myself have experienced the PERFECT NORMAL EXISTENCE of elves and fairies, being able to contact us and communicate. And the most stunning experience was, THAT THIS CONTACT IS COMPLETELY NORMAL! The number of books about these subjects is increasing, because people have the strong urge to share their own experiences with their fellow men... Is it pure coincidence, that there are more and more books and movies about LIFE beyond our narrow minds, like 'Lord of the Rings', 'Harry Potter' and others more? The Angels guiding MANKIND are preparing us for the confrontation with the worlds existing in the higher vibrational realms of EARTH, as well as with other Worlds in the width of SPACE: They are preparing us to meet our Brothers and Sisters from the REALMS of the INNER and the OUTER WORLDS. MANKIND IS STANDING AT THE THRESHOLD OF AN IMMENSE WIDENING OF CONSCIOUSNESS! They say that SANTA CLAUS is an commercial invention of the Coca Cola Company. That may be so, but it only concerns the modern outfit of SANTA CLAUS. Coca Cola has used SANTA to show their colors and now he appears everywhere wearing this bright red outfit. But SANTA himself has no commercial background at all. The Brockhaus Lexicon of 1985 says, that the person of SANTA CLAUS goes back to Saint Nicolaus, a legendary saint, and again this legend goes back to two historical persons: one of them was the Bishop Nicolaus of Myra (Lykia), who lived at the beginning of the 4th century, and the other one was the Abbot Nicolaus of Sion, who died on Dec 10th, 564 as Bishop of Pinara (Lykia). Based on the person of the legendary saint who had been worshipped in Myra from the 6th century on, the person of the byzantine Nicolaus emerged. In the 9th century, his cult was celebrated in Italy, since the 19th century in Germany as well. Nicolaus is the patron of sailors, tradesmen, bakers and scholars e.a. as well as one of the 14 Helpers in Needr, his day: 6.12. Saint Niclaus lives on in the peoples' custom named after him, when on the eve (December 5th) or in the night of his feast (St.Nicolaus-Day) a white-bearded man dressed as Saint Nicolaus comes to the houses of the people to give gifts to the children or punish them with his rod. By and by, Nicolaus was accompanied by other persons who were meant to act as bogeymen to frighten the children into obeying their parents (Krampus, Knecht Ruprecht e.a.)..." for those countries where St. Nicolaus Day is celebrated! 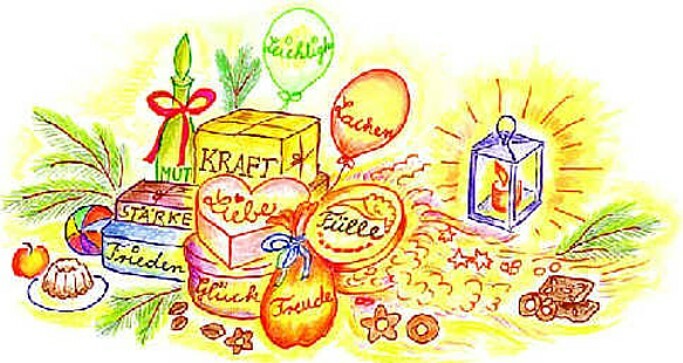 Saint Nicolaus was the source of the original IDEA of SANTA CLAUS, who gives JOY to the children on Christmas Day. His ASSIGNMENT is the bringing of gifts. Telepathically, he perceives the thoughts, hopes, prayers and wishes of the children and works with his POWER OF MIND towards their fulfillment, for example by inspiring parents, friends and relatives. Without our conscious knowing, these processes take place on a subconscious level, mostly in dreams, but nonetheless they are REALITY. The different SANTA-Personalities of the different countries have the specific attributes, that the children of each country have given them in their MINDS and HEARTS. But above all of them stands the universally valid COMMON IDEA OF THE GOOD-HEARTED SAINT, the HIGHER, IDEALISTIC PICTURE of the HOLY OLD MAN, who GIVES LOVINGLY AND FREELY from HIS PLENTY, according to the GOOD the children have gathered within their hearts during the past year. SANTA CLAUS is always very old, yet young at HEART. The WHITE hair of his head, his whiskers and beard, but also the white fur of his coat are symbolizing timeless AGE and WISDOM, but also the clouds of the sky, the Unearthly... They suggest a white aura of PURITY AND LIGHT. The same goes for the glistening WHITE of the snow from where he comes, symbolizing not only the winter season when CHRISTMAS is celebrated, but PURITY and LIGHT as well. All of these attributes are pointing to a HEAVENLY BEING. This way, Saint Nicolaus was worshipped once as a Saint of unending GOODHEARTEDNESS, full of the JOY OF GIVING and SHARING, symbolizing COMPASSION and UNCONDITIONAL LOVE. He is always laughing merrily, in obvious OPENNESS, with LOVE FOR ALL MEN. He has no problems, no desease, no pain, no hidden reservations against us - so his merry laughter is also the mark of PURITY and HEAVENLY JOY - And with his laughter he is bringung these QUALITIES to MEN. His coat is not always of the bright red color - it can have different colors, too. The colors symbolize different qualities. 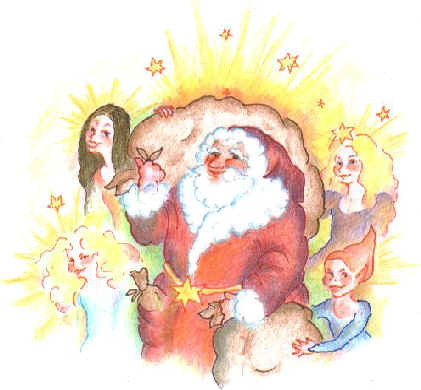 Santa Claus is always coming out of the forest, which is the symbol for everything secret, dark, unable to grasp, scary, dangerous, also for the "other side" - but at the same time the glittering snow, the glistening stars above and his merry laughter symbolize that there is no need for fear, but every reason for JOY, because the WONDROUS, the MIRACULOUS, the LIGHT-full, the BEAUTY-full is now coming down to us from the HIGHER DIMENSIONS - and of those Santa is part of. Actually he is the announcer, the messenger of the coming JOY, yes, even the bringer of this JOY, like the Herald Angel and CHRIST himself - and this is accentuated by the Christ child accompanying him sometimes! The Christ child is also meant to take the little children's fear. He is always big and heavy - in former times a heavy body was a sign of living in abundance, of being wealthy, of having enough to eat, enough of everything. But here it also means living in PLENTY, which surpasses material abundance, though. PLENTY means being part of everything that GOD is pouring out over MANKIND, over CREATION - everything material and immaterial: LIFE in the HEAVENLY KINGSDOM OF GOD - what Jesus CHRIST had promised us. And EVERYONE of us has the RIGHT to this PLENTY, as each one is GOD'S OWN CHILD - only: most of us cannot believe this, as they think they do not deserve much, let alone PLENTY, because they are 'sinners'! And so we cannot grasp that we are CHILDREN OF GOD, deserving all the PLENTY that is poured out over us! continuously at every second of our LIVES! A dear friend saw an even deeper symbolism: Santa Claus is not only responsible for the wishes of children but of MEN in general, also the grownups' wishes, that is. It is his job to give those people who do not trust themselves and their own potential, the CHANCE to discover what their own wishes actually are, so they can become CONSCIOUS of their deepest, their most hidden wishes! And so they should learn to express, just like little children do, without any fear, without any shame, what they - deep in their HEARTS - long for. Because only then these wishes can be fulfilled. Santa fulfills the WISHES coming from the HEARTS of people, not the material wishes; these can be bought in earthly stores - and Santa inspires the shoppers to buy those gifts for their beloved ones. BUT GOD, CHRIST OR SANTA HIMSELF FULFILL THOSE WISHES COMING FROM THE HEARTS OF MEN! This includes also taking away the childrens pains when they are told that Santa does not exist! Actually Santa gives MEN an initiation into the PLENTY, into the GIVING and SHARING - and therefore into the MEANING, into the SPIRIT OF CHRISTMAS: THE PROMISE TO MEN THAT DARKNESS WILL BE OVERCOME. THROUGH Santa ACTUALLY HEAVEN AND EARTH TOUCH - FOR A SHORT PERIOD OF TIME EACH YEAR, with the PROMISE, that some day it will be like this FOREVER, because we ourselves are creating our REALITY within our HEARTS! And what else can be behind Santa than the IDEA OF GOD as the FREELY SHARING FATHER, because GOD fulfills everyone of our wishes and answers to all of our prayers. But the fulfilling of our wishes does not aways come when we expect it, but often when we do not expect it, but when our soul is eady for it. Then we may not realize the connection between the wish and its fulfillment anymore. I checked the vibrations of diverse national Santas and found the German Santa to be astonishingly high vibrating among the European Santas; the Santas of the Scandinavian countries werde higher - but the United States Santa had much higher vibrations than all the European Santas, including the Scandinavian ones! The reason for that must be that the US Santa is probably the nicest one, and the children in the USA must believe in him more and love him deeper than the European children. And the US Santa does not seem to punish anyone, at most he advises. But another reason is that there are many more American children than children living in Europe, within plus outside of the European Union, and maybe that the US citizen accept children more and have larger families. I found out that it makes a great difference how many people believe in Santa, and whether Santa is more of a topic in public life - because then more POWER is projected into the subject, filling it with Life and Love. So SANTA CLAUS is much stronger than the European Santas - inasmuch so, as there are many different Santas in Europe, but only one SANTA in the USA. I tested these statements with my HEART-Chakra and found them TRUE, and you can certify it just the same. No Cosmic Being would punish children or - but Santa was a being created by MEN, not only by the children but by the parents. And he came from the times when it was most important that children had to obey. Most of all they had to honor and obey their parents and not be idle, and thus they later learned to obey their king. My grandmother, born in 1876, had to stand at the table during dinnertime and honor her parents by addressing them in a very polite way! As the times fortunately have changed and relationships became more relaxed, also the WEIHNACHTSMANN has changed. Die Veränderung einer menschlich geschaffenen Wesenheit geht langsam vor sich, viel langsamer, als die Veränderung eines Menschen. Denkt nur daran, wie die Verhaltens- und Denkmuster der Menschen von Generation zu Generation weitergetragen werden. Die beiden Weltkriege und die grundlegenden gesellschaftlichen Veränderungen des 20. Jahrhunderts jedoch haben den WEIHNACHTSMANN ebenso verändert, wie sie die menschlichen Prägemuster änderten. Because of the cultural and economical influence of the USA in Europe after the last world war, especially noticeable in the media, movies and advertizing, also the image of the WEIHNACHTSMANN and other European Santas began to resemble more and more that of SANTA CLAUS. Yes, one can even say, that the WEIHNACHTSMANN from his looks as well as his characteristics has melted with SANTA CLAUS. He became more loud, more relaxed, more cheerful and much closer to the children, and their behaviour during the lat 12 months prior to Christmas lost the weight of earlier times for the question whether a child would get a present or not. Maybe he now asks for the behaviour as a matter of form; but it always is clear that no one would be left with empty hands or even be punished with Santa's rod: In the age of globalization even SANTA was globalized - and his oufit lost its association with Coca Cola! From September on SANTA shows up in TV and other advertisements so often and massive, always with the same shrill oufit, that even smaller children should have problems accepting SANTA as a wonderful, miraculous being, as the MYSTERY that he really IS, just like the beings from fairy tales. But to my great surprise the belief in him is untouched, and his popularity seems to be still increasing by his many "spots". And you can certify that with your HEART-chakra, too! The wishes and needs of the little ones do not follow the way grownups are thinking, as children still are living in the present, not comparing with former times the way we grown-ups do! They always make the best of the conditions they live in, in order to fulfill their need for JOY and HAPPINESS. But also to SANTA it is unimportant how he is called and dressed. He shows himself how children imagine him - and to him only his designated job is important! And as SANTA CLAUS even the WEIHNACHTSMANN is nothing but sweet. He is the essence of a dear old man, who has the ideal grandpa-image for each child, and there is no more punishment and no more rod! He is also of a simpler nature and has a more specific, clear identity, than the awe-abiding German WEIHNACHTSMANN: dwelling at the North Pole, where the toys and other gifts requested by millions of childrens' Christmas lists are being fabricated by a team of enthusiastic elves and dwarves, SANTA's faithful helpers; he also is married and has a wife, Mrs. SANTA, and a large sled with eight reindeers, being led by the reindeer Rudolph; and with them he comes to the populated areas of our planet each Christmas and visits all the houses where presents are to be left. Children need these transparent informations about SANTA'S way of living very much. From a certain age on they want to know everything in detail as to compare with their own living conditions. And these few informations are perfectly enough for then and satisfy their interest, because they seem logical to them. Even little Children really are able to think logically, very much so! SO SANTA HAS TO HAVE A WIFE! AND ACTUALLY, GOD HAS A WIFE, TOO! It has been a long time since I believed in the WEIHNACHTSMANN, but in my reminiscence this person had always remained rather uncertain and in the dark. Questions were never answered clearly, sometimes even avoided. Actually all I knew for certain was that he came with a large bag and his rod from out of the forest, out of the snow and cold, accompanied by the Christ child, which seemed nebulous to me because I was not familiar with religious figures at that time. I remember though, that I thought about the discrepancy between the relatively small size of his bag and the impossibility that it should contain presents for ALL children, even if each one would get nothing more than an apple... Still the WEIHNACHTSMANN was part of the Christmas magic to me, as little as was possible at that time. In Germany he is called WEIHNACHTSMANN, in den USA SANTA CLAUS, in France PÈRE NOEL, in Russia FATHER FROST, etc. And yet he comes to each child on earth, bringing them GIFTS. Some of them can be seen, others are invisible to the eyes and only visible to the HEART. And he brings to all the children on earth he JOY OF CHRIST, THE LOVE OF HEAVEN. And he brings these GIFTS also to each grown-up, because EVERYONE IS A CHILD OF GOD.